NEXT PRESCREENING: Sunday, February 24, 3:00 to 5:00 p.m.
8 WEEKS TO WELLNESS 2019 is scheduled to begin February 25 at 6:00 p.m. and will continue to April 29th at the H. D. Colburn Gym. All participants must be prescreened. The next pre-screening date is Sunday February 24, 2019 from 3:00 p.m. to 5:00 p.m. Plan to attend, your body will love you for it. Prevention is the key. This is a good way to enhance your overall wellbeing. Don't miss out on the opportunity. 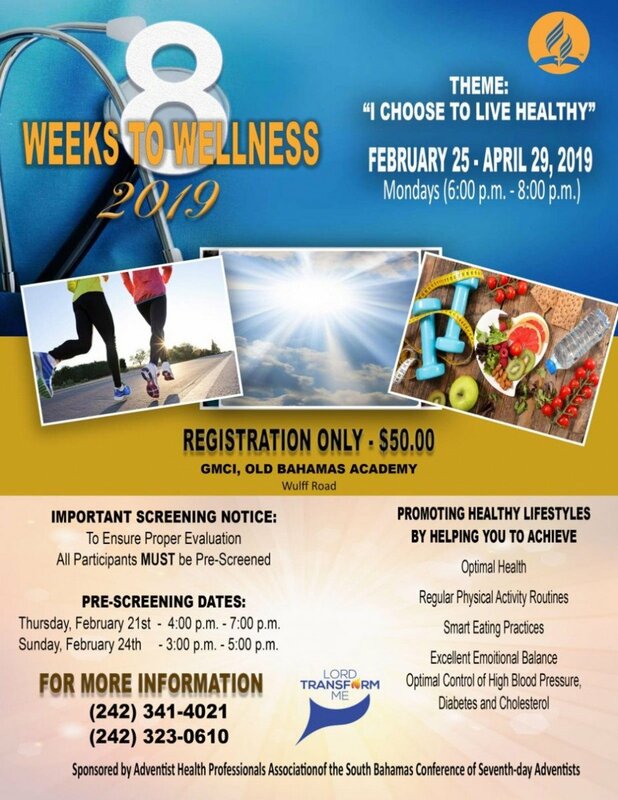 Coaches for 8 Weeks to Wellness 2019 All persons interested in volunteering as a coach for this year’s 8 Weeks to Wellness program, please contact Sister Nathelyn LaCroix at 242-323-0610, WhatsApp 242-826-8486 or by email at: [email protected] . Training is scheduled for February 3, 12 and 19, 2019. Venue to be announced. For more information please contact Nathelyn LaCroix, Health Director.